Car like brand new, only 7000 miles. 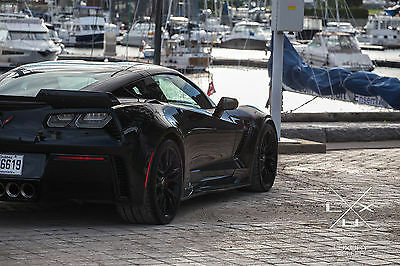 Z06 3LZ FULL LOAD. Ceramic break, carbon ground effect, carbone roof. Manual 7 speed. Open to exchange for corvette ZR1 + CASH. 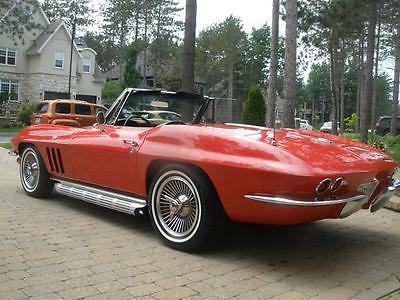 1965 Corvette convertible 327/365HP with factory A/C (only 133 produced). Originally from USA, now in Montreal, Québec (CANADA). VIN # 194675S120538, odometer reads 23,228 miles. Matching #’s 327/365 hp engine. Casting number 3782870. Date code C 9 5. Engine pad number 5120538 F0331HK (solid lifters). 4-speed transmission with the VIN # stamped on the side case. Differential casting #3876476. Rear end code AO 1 4 65, 3.70:1 rear end gears. Correct air cleaner, upper and lower ignition shielding. Detailed engine compartment. Optioned with Factory air conditioning. AM/ FM radio with power antenna. Clock runs perfectly. Side pipes, repro knock-off, new clutch, new stainless steel brake calipers, electronic ignition, new fuel pump, new carburetor Holley. Original bonding strips. Few character marks. Always stored in an heated garage. Runs perfectly. Red hard top available. All original and match numbers except for the color: original color was Glen Green with green interior. More pictures available on request. Broker's fees to import in USA to be negotiated in the selling price. Transportation fees not included. 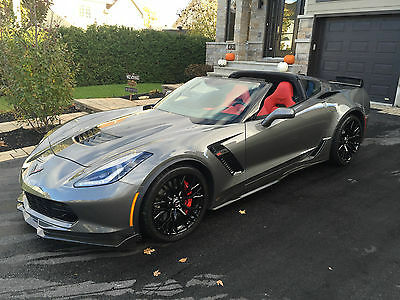 2015 Chevrolet Corvette Z06 TARGA Z06 Z07 Chevrolet Corvette 2015 Loaded 8speed auto. This is a 100% completely restored vehicle. From top to bottom. A real X22 BIG BLOCK serial number car (non-matching number) 396 with correct stampings. Crimped exhaust system. Factory WORKING AIR conditioning. 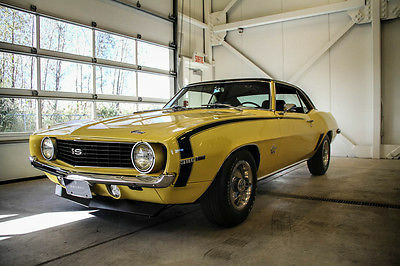 Everything works on this freshly restored rare 1969 Camaro. Interior completely new with black leather seats. This is a turn-key driver that sounds and drives great. Vehicle has 10 Miles since restoration. Vehicle located at Maserati Laval, 1750 Chomedey, Laval, H7T 2W3 open Monday- Thursday 9:00-8:00, Friday 9:00-6:00, Saturday/Sunday by appointment - Tel:450.238.8000. Serious bidders only please. If you have less then 5 buys or 0 feedback or BAD feedback you need to contact us before bidding or your bid will be canceled thank you. 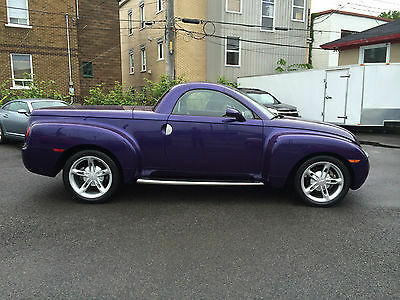 2004 CHEVROLET SSR PICKUP TRUCK Original US truck imported to Canada Opportunity knocks ! This is the ultimate future collectible enjoyable toy/truck, Drive it either on a day to day basis or on very nice days while it appreciate in value. Rare color and in an incredible rust free condition. You will enjoy the versatility of a pickup and a convertible at the same time. Ideal to ride solo, with your «plum crazy » bike or boat. Comfort convenience all around with 300 HP from the economic but powerful 5.3Litre engine. I has less than 50K miles with all the amenities included and in perfect working order. Ready to be enjoyed at a very competitive price. Pics say it all !!! Will gladly respond to any request for info. PAYMENT TERMS & CONDITIONS Bank wire is the fastest, easiest and safer option . A non refundable Paypal deposit of 500 $ will be required in within 24 hours after the end of the auction. Complete payment in within 7 days from the end of the auction. 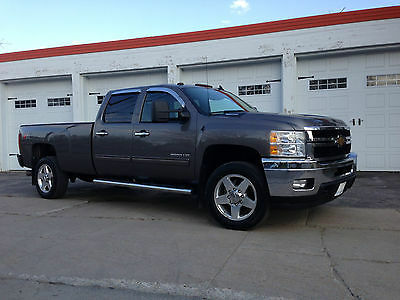 Full payment before shipping the vehicle or before to trailer it back home. The vehicle is not mine, I am listing it for a private party. All sales are FINAL. 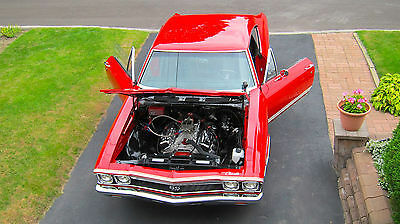 You can come over and inspect the car if you wish though, we have a local airport (YQB) and I can pick you up. CUSTOMS AND OTHER FEES INVOLVED FOR USA BUYERS, a 350$US fee applies for US broker and customs bond. If you pick it up, those fees disappear. Either way, we may provide you with required to cross border and/or register the car. No duties involved here as it is a domestic car. FOR CANADIAN BUYERS, there are no fees involved other than shipping and your provincial or harmonized sales tax. OTHER COUNTRIES BUYERS, please check with your local customs and motor vehicle bureau for the fees involved at your end, I can get a couple rates to take it to your preferred sea port including export paperwork. SHIPPING TERMS Shipping that kind of vehicle from Quebec city (Canada) to York State is about 1000$, to Florida 1800$, to Texas, about 2100$ and to California, about 2600$. If you have a carrier on your own, we can work that out too... Should you need more info contact Jacques André anytime EST at 418.569.5863. 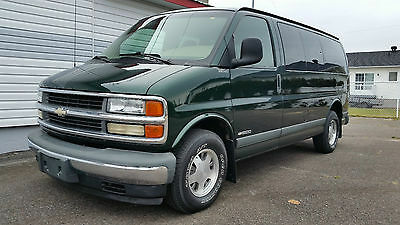 Chevrolet : Express LS 8 PASSENGER ONLY 9500 MILES EXTREMELY LOW MILES 9500 MILES 1-OWNER, ORIGINAL PAINT, MUST SEE! 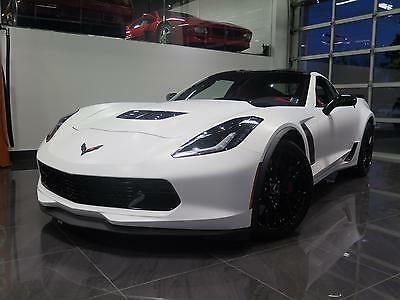 2015 Chevrolet Corvette Z06 3LZ 700HP AND 700 POUNDS OF TORQUE 2015 CORVETTE Z06 3LZ AUTOMATIC V8 6.2L WITH HALLTECH COLD AIR INTAKE RED LEATHER SPORT SEATS NAVIGATION/ REVERSE CAMERA CARBON FLASH FULLY WRAPPED IN WHITE/BLACK ORIGINAL PAINT IF UNWRAPPED COMPLETE MANUFACTURER'S WARRANTY Everything we do is focused on providing absolute clarity so that you can make an informed decision and buy with confidence. Compare our vehicles and reputation to others and see for yourself how we take the worry out of buying a vehicle. OUR VEHICLES ARE FIRST QUALITY. THEY ARE SYSTEMATICLY INSPECTED BOTH IN TERMS OF MECHANICS AND OF AESTHETICS. LOMBARDI SIGNATURE IS PROUD TO OFFER VEHICLES WITH COMPLETE INTERIOR/EXTERIOR RECONDITIONING. THEY ARE SYSTEMATICLY INSPECTED BOTH IN TERMS OF MECHANICS AND OF AESTHETICS. Contact Internet Sales for more information: Toll-Free 1 866-781-5983 Phone 1 514-255-2222 Roberto D’Ambrosio: rdambrosio@lombardisignature.com ***WE WELCOME WORLDWIDE CUSTOMERS! *** ***Worldwide Shipping is available, please contact us for quote! *** TO U.S BUYERS WE CAN HELP SIMPLIFY YOUR TRANSACTION, WE CAN ASSIST YOU IN TRANSPORT AND DUTY TO HAVE VEHICLE CLEARED CUSTOMS AND READY TO BE PICKED UP IN SECURE STORAGE FACILY IN CHAMPLAIN, NY TO ALL CANADIAN CUSTOMERS, WE OFFER NATIONWIDE TRANSPORT SERVICE. CALL OR EMAIL US TO GET A QUOTE. LUXURY CARS IN MONTREAL We welcome you to view our website at www.lombardiSignature.com, your destination for buying a luxury car for more than 30 years. We offer a vast selection of luxury pre-owned vehicles available. Our large inventory of available models, combined with unmatched customer service excellence, ensures you can find a luxury vehicle that meets your needs and your budget. During the past 30 years, our success has been achieved over time thanks to the ongoing loyalty of our customers, our acquisitions and our spirit of innovation, not to mention our strong network of links in the industry and with our financial partners. Don’t hesitate to contact us online or by phone at +1 514-255-2222 to learn more about our services. We are located in Montreal, Qc (Canada). Financing Information INTERNATIONAL BANK WIRE TRANSFER ($USD) MUST BE MAID IN FULL IN ORDER TO START PROCESSING SHIPPING OF THE VEHICLE. Please contact us today at +1514-255-2222 for more information on financing Warranty Information Unless otherwise stated in the vehicle description, this vehicle is being sold "as is". No representations or warranties are made by seller, nor are any representations or warranties relied upon by bidders in making bids. Manufacturer's warranties may still apply; Contact us for more information about the full factory warranty. Extended warranties may be available; please contact us for details if you are interested in purchasing an extended warranty protection for this vehicle. Shipping Information Lombardi Signature can help assist you in finding a transportation company to ship your vehicle. We have shipped vehicles all over the US, Canada, and overseas using only the most reliable and dependable companies. The customer is responsible for all charges related to the shipping cost unless discussed prior to the purchase of a vehicle. Our clients have the option of shipment in an open trailer or an enclosed premium trailer at an additional cost. Shipping delays may occur due to circumstances like weather, traffic, holidays, and etc. Once the shipment leaves our premises, Lombardi Signature is not responsible for any damages that may occur after pick-up. If you have any questions regarding shipping please feel free to call us at +1 514 255-2222 or email us rdambrosio@lombardisignature.com OUR VEHICLES ARE FIRST QUALITY. LOMBARDI SIGNATURE IS PROUD TO OFFER VEHICLES WITH COMPLETE INTERIOR/EXTERIOR RECONDITIONING. THEY ARE SYSTEMATICLY INSPECTED BOTH IN TERMS OF MECHANICS AND OF AESTHETICS. CALL US FOR MORE INFORMATION! We reserve the right to end this listing at anytime should the vehicle no longer be available for sale. The following terms of sale apply to all of our listings. Payment Terms: The successful high bidder will submit a $1000 non-refundable deposit within 1 business day of the close of the auction to secure the vehicle. Buyer agrees to pay remaining balance due (plus applicable fees and taxes) within 3 days of the close of the auction. All financial transactions must be completed before delivery of the vehicle. Payment Methods: Cash (In Person), certified check, bank transfer, or 3rd-party financing. Fees and Taxes: Applicable fees are: Documents fees 499.00Sales tax and custom fees. Please call for more information regarding the sales taxes. Out of state buyers are responsible for all state, county, city taxes and fees, as well as title/registration fees in the state that the vehicle will be registered. All funds must be in US dollars only. Please be sure to have full payment and/or approved financing in place before making your final bid. International buyers, wire transfers only. Call us for more information. Shipping The buyer is responsible for all shipping charges. We will assist the buyer with finding a shipping company - call us at +1 514-255-2222 for more information. We assume no responsibility for damages incurred after leaving our premises. If the vehicle is going to be shipped, full payment must be received before the vehicle is delivered to the shipping company. Buyer's Inspection: Every effort has been made to accurately and fairly describe this vehicle to you. Lombardi Signature has tried to disclose all information known about this vehicle for auction. Please be advised that used vehicles will have typical scratches and dings inherent for their year and mechanical parts are subject to fail. Lombardi Signature welcomes and recommends a buyer's inspection. If you plan to have a buyer’s inspection, please make sure you inspect the vehicle prior to the auction ending. Buyer is responsible for any inspection charges and fees. Warranty: Unless otherwise stated in the vehicle description, this vehicle is being sold "as is". No representations or warranties are made by seller, nor are any representations or warranties relied upon by bidders in making bids. Manufacturer's warranties may still apply. Extended warranties may be available; please contact us for details. Notice to Bidders: We reserve the right to cancel all bids and end an auction early should the vehicle no longer be available for sale. Bid Retractions: Bid retractions are not allowed nor will be recognized within 12 hours of auctions end. Seller will not be obligated to sell in the event of a late retraction. Negative Feedback Bidders: We do not allow bidding from negative feedback bidders. New bidders with zero feedback rating should email us or call us prior to bidding. Successful Bidder: The winning bidder will be contacted via email after the auction closes or he/she must contact Lombardi Signature within 24 hours to proceed with payment and delivery arrangements. Non-Paying Bidder: If the deposit is not received within 1 business day of the close of auction or if the balance is not paid in full within 3 days following the close of auction, we reserve the right to re- list the vehicle or sell the vehicle to the next highest bidder or another qualified buyer. 1999 Chevrolet Corvette C5 FRC , hard top coupe, 6 speed Manual, Black on Black Leather interior, LS1 V8 STOCK, 94 500 Miles, HUD DISPLAY Originally a car from Boston, Ready to be shipped out once payment is received in FULL. Car is in good condition , fair for the year and mileage, please verify pictures for further body tear and wear. This is one of the rarest FRC C5 clean title corvettes around , I am 3rd owner of this beautiful jewel. 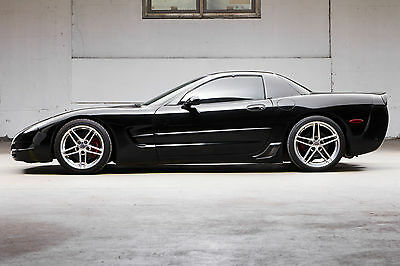 Vehicle is on 08 c6 Z06 original wheels with front tires thread wear 9/32 and rears 4/32. Car is collision free , clean carfax report. 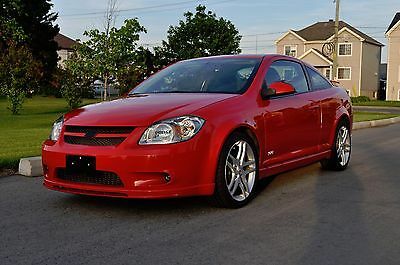 I have owned this car for the past 6 years, drives great , steering tight, sounds great , REAL ATTENTION GRABBER. Mods: Cat delete , BORLA cat back exhaust, LS6 INTAKE MANIFOLD, BLACKWING AIR INTAKE, LOWERING BUSHINGS, NARDI STEERING WHEEL, IN-DASH DOUBLE DIN CD PLAYER, TINTED WINDOWS, GM MOTORSPORT BRAKES. TWM SHIFT KNOB, UNDERDRIVE SLP CRANK PULLEY, FULL BLACKED OUT LIGHTS, SLP REAR SPOILER LIP. XENON LIGHTS & FOGS. ORIGINAL PARTS ( muffler, radio, steering wheel) AVAILABLE UPON REQUEST AT BUYERS SHIPPING COST. BUYER RESPONSIBLE FOR SHIPPING. Maintenance: Gm performance brakes all around , oil change completed, Thanks . Exterior: Shark Grey Interior: Red Motor: V8 6,2 L (650HP) Manual Options include package 2LZ, Carbon Fibre Ground Effects Package (carbon fibre-pinted splitter and rockers and more agressive rear spoiler), Chevrolet MYLink Radio with navigation including video and data recorder for performance and front camera, Carbon hood stinger stripe, Wheels black aluminium and much more. A real beauty!!! 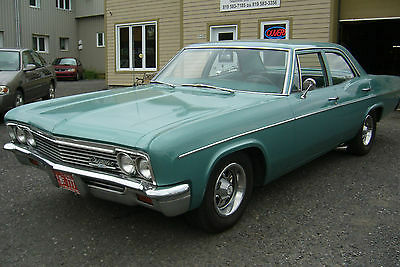 This is a 1966 Chevrolet Bel Air 4 door with only 44 000 miles on it and is Extra Clean.There is no rust or patch under the new paint. Color was just mat after sitting 25 years in a barn and have been professionally repainted with the original carcel color. The seats have been professionally recover and all the mechanics have been revised. The frame and floors are like new. The chrome are great to. This is a daily driver and can do long distance trip. It have the 283 engine, new breaks, new double exhaust, original carpet, good vault roof. All the glasses are good. This car is sold as it is. Feel free to ask any questions. The buyer will have to assumed the transport. The car is located in Canada near the border of Coburn Gore in Maine. I will provide clear Title and a selling bill. I use to sell antique car in the U.S. and it can be done easily. The buyer will have to make a 500$ deposit 24 hours after the end of auction by PayPal and pay the balance due before sending transport. All the currencies are in U.S. money. If you are looking for a great running piece of history, this is it! 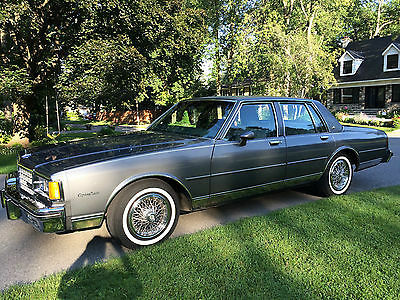 Hello, up for sale is my 85 Caprice Classic all original, never winter driven car with just over 22 000 miles (35 500 Km). The car is in excellent shape, all the trim is present and in good shape. The paint is original except for the right side underneath the pinstripe where there is evidence of previous repair to the right rear door. The engine and transmission work very well, brakes are very good also. Most repairs to be done to the car are due to is sitting in storage for an extended period. A/C needs to be recharged, cruise control doesn't engage and original tires need to be changed. The only non original item is the carpet in the rear trunk which is from a later LS model. It can be easily removed. Overall the car has very little flaws but it needs to be properly detailed and cleaned to become a show quality car. I am the second owner and have all the original documentation from the original owner and the dealer it was purchased from. Title is clear. The car can be driven anywhere without issues. I am open to export the car, but the buyer has to make all arrangements with the freight company, I will bring the car to the port of Montreal if needed. Export to the United-States requires a simple form to be completed at US Customs. Car can be seen, inspected in person and more pictures and higher resolution pictures can be sent by email. Please do not hesitate to ask any questions.